The crisp December chill slaps my cheeks as I pause to take in the scenery outside the door. There is a reason that I love December so. It is not for the cold, although it forces my senses to attention, rather, it is the warmth, from the ever-burning fire of December, that captures my heart. The rains have ceased and the frost of winter has arrived. The earth sparkles and shimmers. Sunlight from above, kisses the ground below. The sight, breath taking and miraculous. The cold heightens focus, my senses suggesting, take another look. There is beauty in the world. A close friend texts, “Where are you? Join us for coffee.” The mall is busy, yet I seek company. Somehow, coffee tastes better with friends. We sit, two generations of women, sharing stories from life. Their company soothes my weariness and I wish to stay near, savouring the warmth and comfort between sips. What would life be without these friends? Love and gratitude are sent forth into the universe. The mall is beginning to fill with people. Young and old shoppers, bustle about. Strangers to one another. Yet, people pause a moment to smile, hold doors for another, share a comment over the clamouring crowd. The red suit, a symbol of Christmas, comes into view. Children stand spell-bound, patiently waiting, in a never-ending line, for a moment, one enchanting moment with, Santa Claus. The wish to receive that special gift is whispered into Santa’s ear. A chance that their wishes will come true. For who does not hear the whispered words of one so innocent to the realities of life. We never forget this moment. Did Santa listen? Hope and love are sent forth into the universe. Does the magic of the holiday season make us kinder to one another? Or is it that we remember that moment of youth, when we knew hope and it filled our hearts. When we whispered our wishes in Santa’s ear and they traveled on the wind to a starlit kingdom far, far away. Perhaps, human nature wishes for hope and love, and when we lose our way, like a compass, these gifts return to us, setting us right back on course. Forgiveness and compassion are sent forth into the universe. For these reasons, December is my favourite month. The twinkling white lights, the allure of gold and silver ornaments, the candle’s light, and the everlasting love that shines forth from mankind. For a moment in time, stand transfixed by a beautiful world. The wonder of fairy tale possibilities surround us as the silent snowflakes tumble. Gently shake the glass snow globe and place it on top of the table. Watch the snowflakes fall. Remember the good, remember the love. Pray for peace and show compassion toward one another. 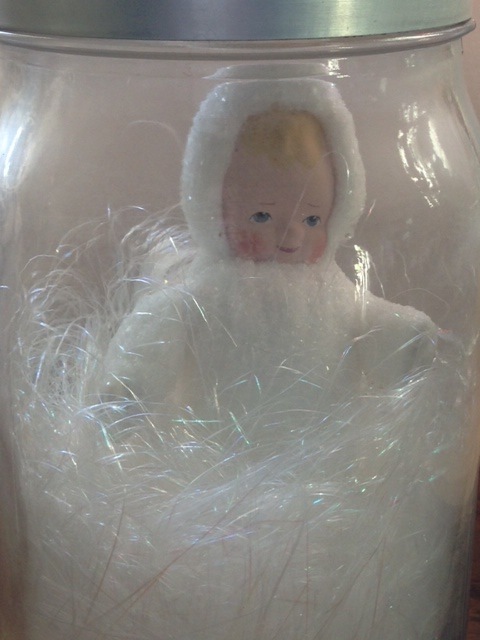 I’m trying to live up to my “name!” The snow baby is a vintage looking “dolly”. I stuffed her into an Ikea jar and added some faux snow! Interesting way to present the little sprite! ~by “live up to my name” I am referring to my behaviour while amongst the throngs of harried shoppers! Very clever re the snow baby!